Steven Ezra and Rebecca Rasmussen in Opus Cactus (Dreamcatcher). Photo by Eddy Fernandez. 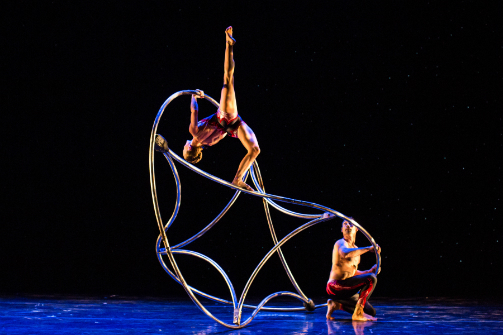 BOTTOM LINE: MOMIX storms the stage with a kaleidoscopic and kinesthetic ode to the grand beauty of the American Southwest. First come the tumbleweeds, neon orbs pulsing and spinning across the space, dark like an abyss. They gradually transform into an anthropomorphic figure, setting a slightly whimsical tone for MOMIX's Opus Cactus. Pilobolus fans rejoice. Moses Pendleton, the co-founder of this famously minimalistic yet radically inventive dance company, has brought his own troupe at MOMIX to deliver a tapestry that depicts the grand beauty of the richly colored sand and fire-like clouds of the American Southwest. Rather than a linear narrative, the show is a promenade of life forms amidst an expansive backdrop of a mystical desert. A dancer’s body slithers backwards across the stage as a lizard; their head becomes its tail and their rear the uplifted head. Every part of the show is a microcosm extracted from the world it creates: the title comes from the recurring motif of bodies folding into shapes of cacti. Opus Cactus is a versatile program that showcases not only the performers’ skills as dancers, but also as storytellers, with the illusory aids of Pendleton and Joshua Starbuck‘s dazzling lighting design, along with Phoebe Katzin's effective costumes. Various creatures are introduced, and some of the most exciting feats of the evening come from the impressive control the performers have. Their movements imitate the rigidities of insects, the nimbleness of reptiles, as well as the fluidity of flowers and the wind. The Pole Dance trio is a highlight of Act I, where the male dancers’ calculated leaps suspend them in midair for longer than you might consider humanly possible. "Dream Catcher," which opens Act II, also took my breath away. A carefully engineered metal sculpture (by Alan Boeding) gravitates as well as elevates the pair of dancers (Steven Ezra and Rebecca Rasmussen) who become more like one entity than two separate halves. I felt transfixed by their dynamic balance, their perfect combination of Yin and Yang. The segment could be straight out of a Cirque de Soleil show, with stunning physical and visual mastery achieved by elaborate accuracy. The constantly revolving metallic structure, animated by the dancers, makes you think of a surrealist painting coming alive. The vivacious images, daring feats, and inventive staging all kept me impressed. However, the pervasive use of Middle Eastern and indigenous elements in the show becomes puzzling and problematic, especially considering the company’s all-Caucasian cast. While the characters of the piece are most anamorphic, and the narrative is largely abstract, I can’t help but raise the question: is this a story the creators get to tell? Opus Cactus seems like a concept and visually driven piece sprung out of the idea of using cultural elements associated with the desert. It translates that imagery into a sensational and eclectic dance anthology. However, at a time when cultural appropriation is a sore subject for many creators, we must be extra vigilant to ensure the validity of an artist’s source of inspiration. Opus Cactus is conceived and directed by Moses Pendleton. Assisted by Cynthia Quinn, Kori Darling, Brian Sanders, Craig Berman Amphaymany Keohavong, Nicole Loizides, Jane'l Caropolo, Kara Oculato, Brian Simerson, Michael Holdsworth and the Ballet Arizona. Costume Design and Construction is by Phoebe Katzin. Lighting Design is by Joshua Starbuck and Moses Pendleton. Puppet Design is by Michael Curry. Sculpture Design and Construction is by Alan Boeding. The cast is Anthony Boccini, Beau Campbell, Samantha Chiesa, Greg Dearmond, Steven Ezra, Lauren Jaeger, Sarah Nachbauer, Matt Ortner, Rebecca Rassmussen, and Jason Williams.